Have you ever marveled over the beauty of an embroidered pillow? 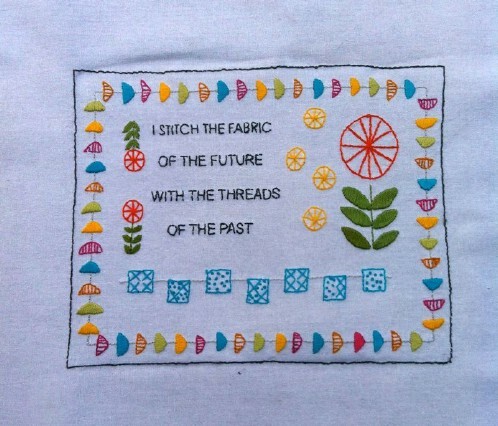 How about a t-shirt that has a custom message that was done in embroidery? Now, have you ever wished that you could do that, too? Well, now you can. If you have been wanting to try embroidery, which is a beautiful way to decorate by the way, I’ve found 25 of the easiest patterns to get you started. 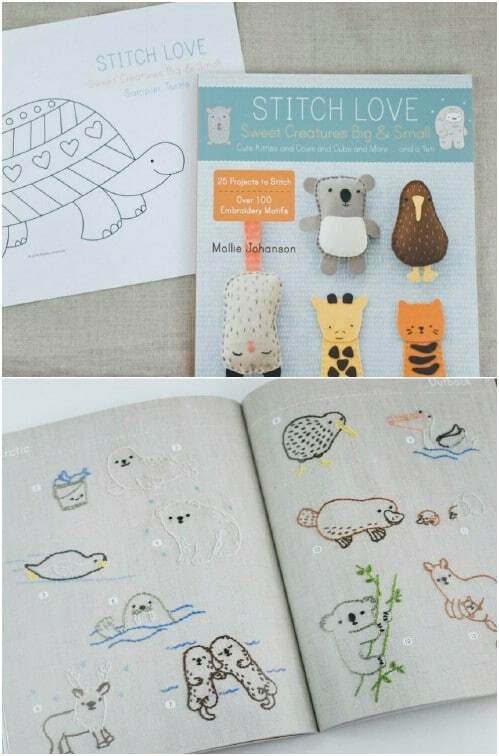 All of these are perfect for teaching you how to embroider and you can use the patterns to create so many beautiful things. From pillow cases and bibs to wall décor, you’re going to love how versatile these patterns are and what you can create from them. 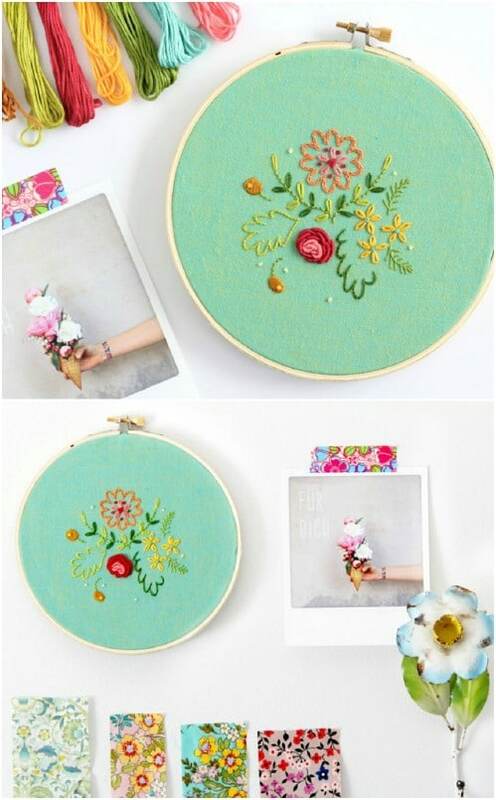 Embroidery is an art that uses an embroidery hoop, thread and a needle to create marvelous images. If you have ever wanted to be able to personalize gifts or customize your own handbags, clothing or other items, now is the time to learn embroidery. And speaking of personalizing gifts, I’ve got a great collection of 25 hand sewn gifts with free patterns that you simply have to see. Embroidery can be used to add décor to just about anything and it’s a really easy craft once you get the hang of it. You can use these patterns to make beautiful quilts, baby bibs, t-shirts or just about anything you want. And, if you want to add some embroidery to a homemade accent pillow, I’ve got a list of 30 DIY accent pillows that would be perfect for adding your embroidered touch. So, whether you’re looking for a new hobby or craft or you want to create beautiful new things to give to family and friends this holiday season, I’ll show you 25 really easy beginner embroidery patterns that will get you started. I love this heart that is done in so many different embroidery stitches. This is perfect for decorating towels or anything you want, really. It’s also a great pattern for learning the different stitches, because you use so many in creating it. If you have never embroidered before, I strongly recommend trying out this heart to get used to the different stitches to use in other patterns. I love this Santa silhouette pattern. It’s really easy to embroider and perfect for making your own DIY Christmas ornaments. You could also fill this one in if you wanted and really dress it up. The pattern is so easy and leaves you plenty of room to customize if you want. 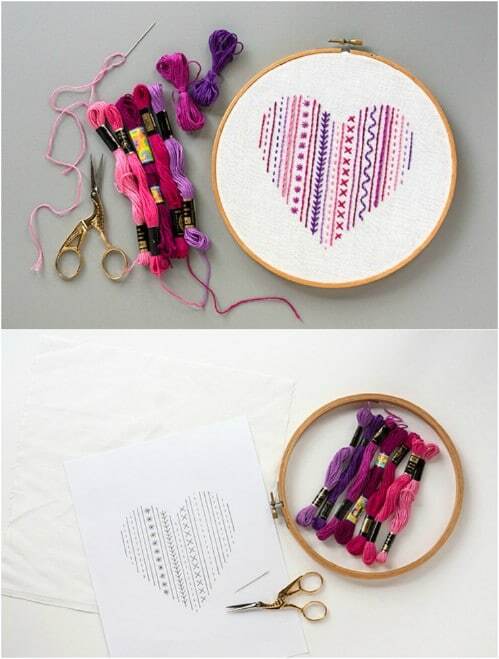 You could also do this one on towels or other materials and turn it into a wonderful DIY Christmas gift. 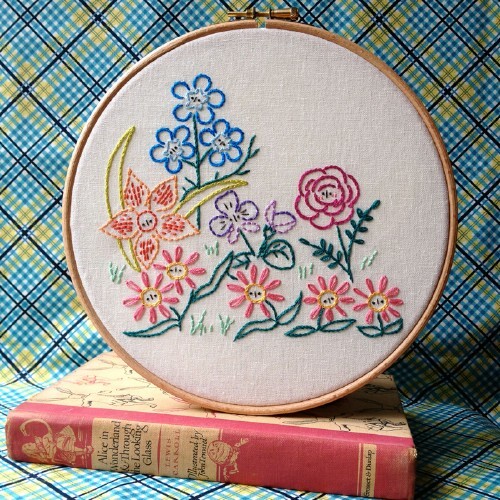 This lovely spring bouquet is so easy to embroider. You can choose the colors that you want to create this one, so it’s perfect for adding as home décor – you can match up the colors of your existing décor. This one won’t take you long at all to finish. You could even turn it into pillow cases or kitchen towels to give as holiday gifts and have them finished in a weekend. This little bee picture is made with many different stitches, so it’s a great first project. You’ll learn the straight stitch as well as a sating stitch, French knot, lazy daisy and so many others. 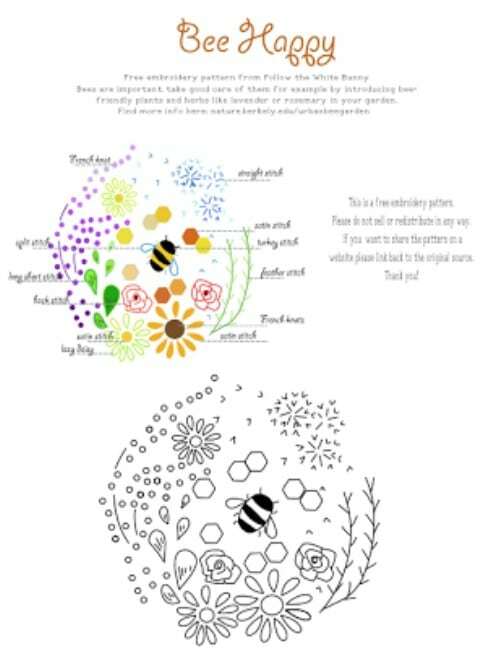 By the time you finish this bee pattern, you’ll practically be an embroidery expert and be able to take on more complicated patterns. 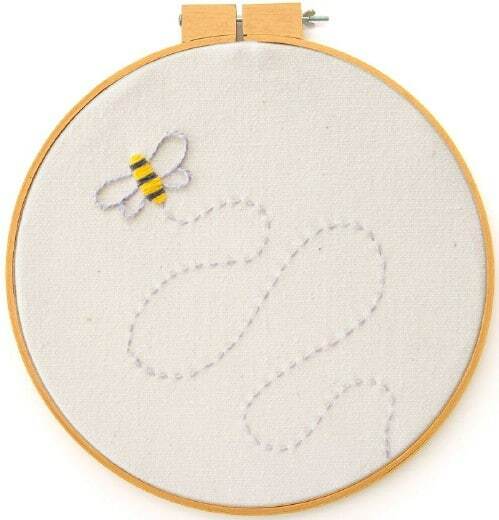 This little busy bee is so easy to embroider and he’s perfect for decorating any number of things from kitchen towels to clothing for babies. This one is so very simple and only uses a minimal amount of embroidery thread. You can honestly have this one done in an hour or so, even if it’s your very first embroidery project. I love how easy these samplers are to embroider and this vegetable garden one is no different. It’s super easy to set up and you can try different stitches to create your veggies. Samplers are the perfect way to get really comfortable with embroidery because they allow you to be as versatile as you want. This veggie pattern is great for hanging in the kitchen when it’s finished or you could easily do this on a set of kitchen towels. 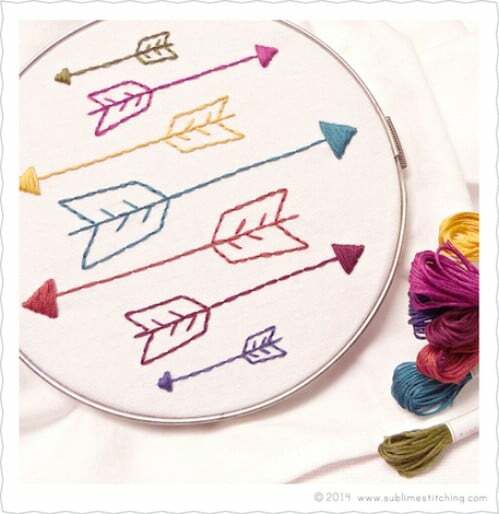 These little arrows are super easy to embroider and the pattern in general is an easy one for beginners. 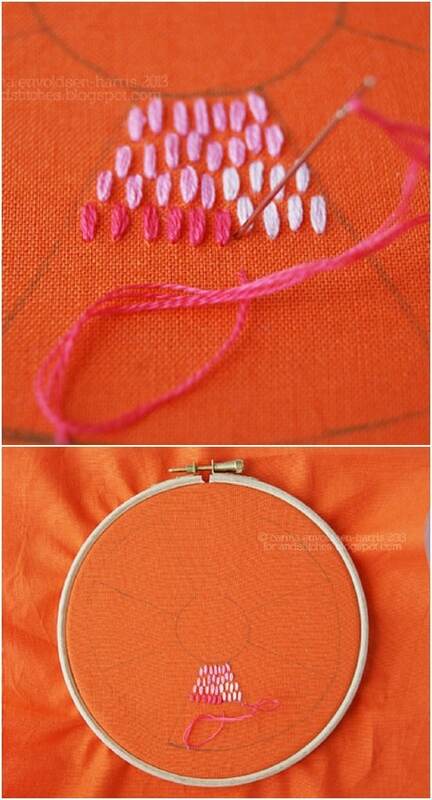 You just choose different colors and practice your stitches by making multiple arrows on your material. You can then use your arrows in any number of decorating projects from little boy’s room décor to pillow cases and so much more. These little posies are so easy to embroider and they are perfect for decorating. You use a number of different colors to make these and you can transition them to a holiday pattern by simply using more reds and greens. 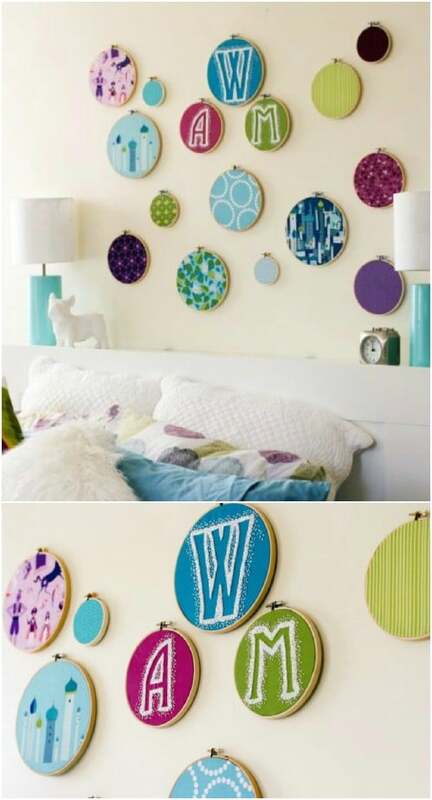 Or, make this a spring pattern by using bright colors. This one is so versatile and the stitches are super easy to do. Use these fall leaves to decorate your home for Thanksgiving! They’re so easy that you can get a number of them finished before the holidays and the pattern is really easy to follow. 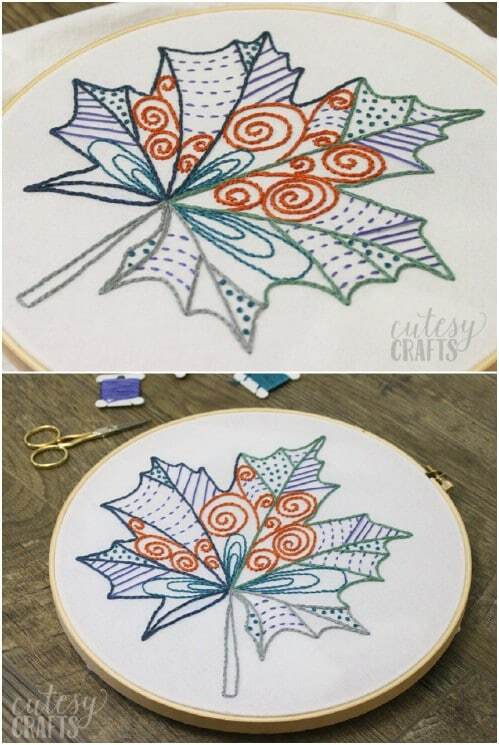 The leaves are gorgeous and you can change them up by simply using different colors when you stitch them. If you want a really simple beginner project that doubles as DIY fall décor, this is it. 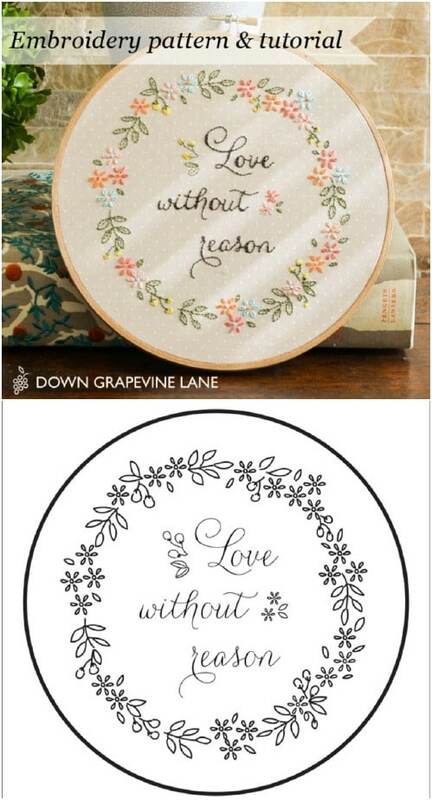 This floral design is so lovely and it has a very inspirational quote…that you also embroider. You can get the pattern in two different sizes and it is simple filled with lovely flowers, that are much easier to create than you may think. This would make beautiful wall art when it is finished or you could turn it into a t-shirt, tote bag or a tapestry to give as a gift to inspire someone special. I love this pattern partly because of its message and party because it is so quick and easy to do. This is gorgeous when it’s finished and is perfect for gift giving or adding to your own home décor. 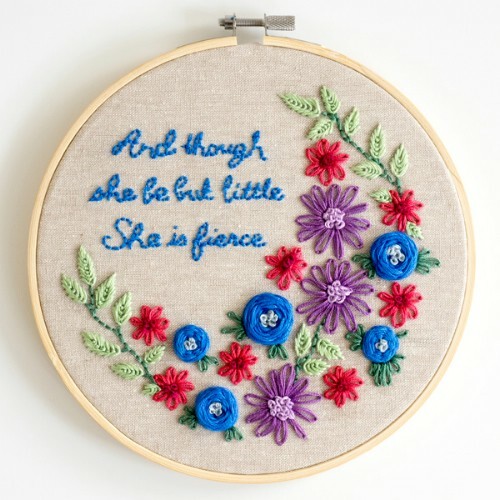 Frame it or just hang it in the embroidery hoop when you finish it – the colors are perfect for just about any décor and the message is so inspirational. This little embroidery project is so quick and easy to finish and you end up with a lovely gift to give to teachers for the holidays. 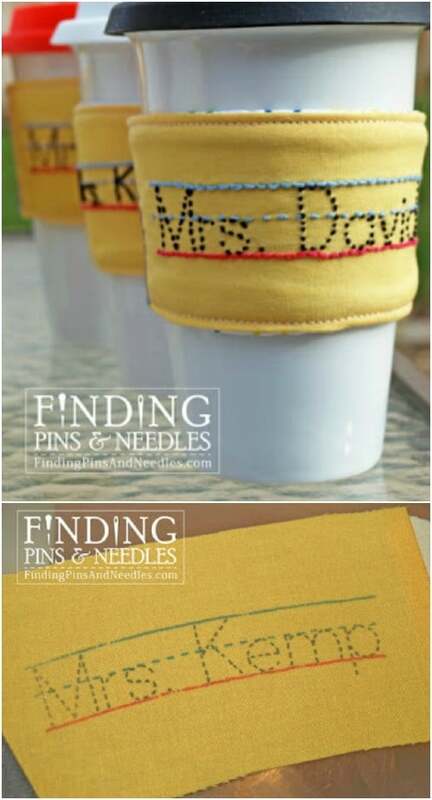 It’s a pencil drink sleeve and you can embroider their names right on the sleeve. The pattern is so very easy and honestly, you can have these finished in about an hour or so, so you have time before the holidays to personalize a drink sleeve for all of your kids’ teachers. These monograms are great for decorating or gift giving and they are really easy to do. You need to know the back stitch, but that’s an easy one to learn. Honestly, as detailed as they are, these aren’t nearly as complicated to make as you would think. You can easily finish one up in a weekend or faster if you catch on really quickly. 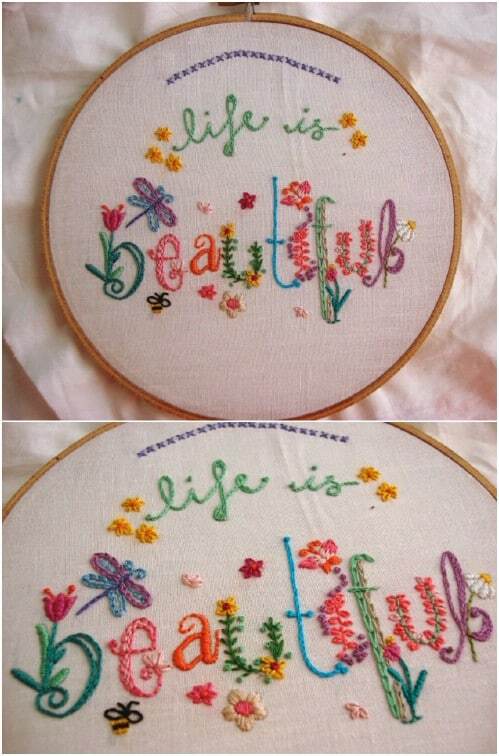 You print off your own template for this one and then just embroider around it. This garden path sampler is perfect for creating embroidered art for garden lovers. Plus, this teaches you how to do the granito stitch which is really simple and the perfect way to make open petals. It’s an alternative to the lazy daisy stitch and can be used in so many things from flowers to making animal eyes. This garden path sampler will only take you a few hours to complete and you can fill it in with various other stitches for practice. 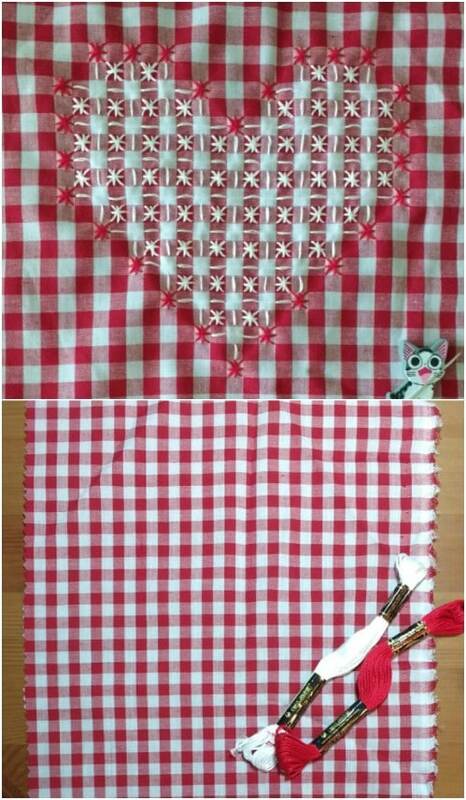 Okay, so it’s not Valentine’s Day, but it soon will be so this heart embroidery pattern is a good one to try. 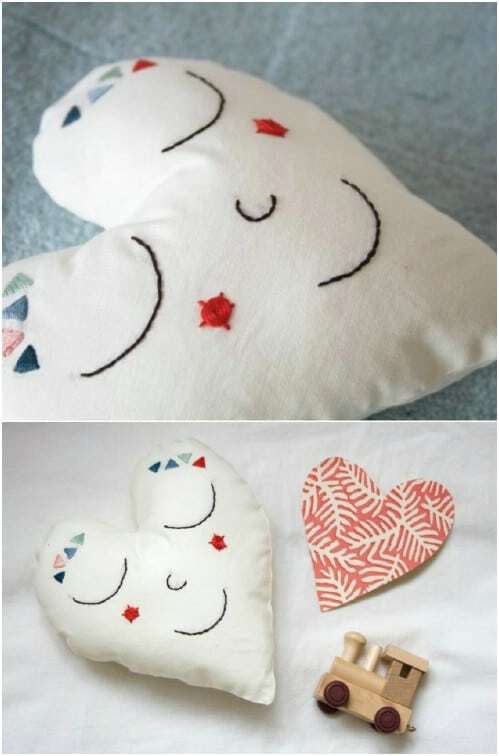 You use a template for your embroidered design and you use those designs to make the most adorable heart shaped pillow. Kids are going to love this or you can use it as an accent pillow in the living room or bedroom. The stitches and pattern are super easy to follow, too. This little pattern uses a number of stitches and is perfect for beginners who need to practice. It makes an adorable square embroidery when it’s finished and is really fast to work up. It’s great for adding some fall coloring to your home – just use orange, brown, red and yellow embroidery thread and stitch away! I love sampler patterns for learning all of the different stitches required to make something beautiful. This springtime sampler gives you the opportunity to learn so many different stitches and when you’re finished, you have a lovely springtime piece to decorate your home. This one is so colorful and the stitches are really easy to learn. Use bright colors to add this to your floral décor for summer. 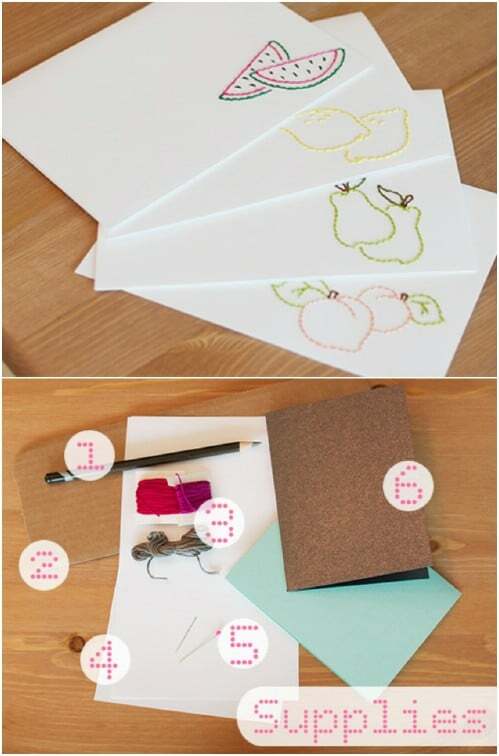 These hand embroidered cards are perfect for just about any occasion and they all display a lovely fruit silhouette. The embroidery is super easy to do and each card should only take you a few minutes to complete. You can actually do any design that you want – even make holiday cards, because you draw in the image yourself. Then just fill it in with embroidery threads in appropriate colors. These are much easier to make than they look and will give you wonderful homemade cards to hand out. 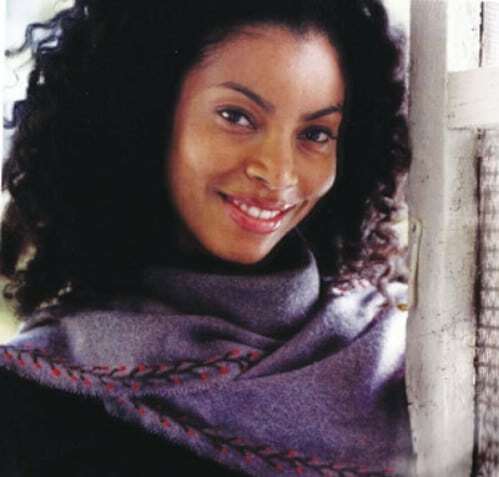 If you are looking for an embroidery project that gives you a lovely gift to give, this embroidered wool scarf with its feather stitching is perfect. Not only is this a gorgeous scarf when it’s finished, it is super easy to make and you can have it finished in a weekend. The straight stitches on the front of the scarf have a herringbone look on the back, so you could totally make this a reversible piece. This garden pattern has so many different flowers and it is the perfect pattern to use for practice on your various embroidery stitches. You use basic stitches like the lazy daisy stitch, stem stitch, chain stitch and French knot, but you can also add in other stitches if you need practice with them. This one is really versatile and makes a lovely wall hanging when it is finished. This sampler turtle also uses a number of different stitches and you can add your own for practice. The designs can be done in many different ways. You start with a basic outline and hen embroidery the lines within the shell in any stitch that you prefer, or any stitch where you may need a bit of extra practice. Turn this little turtle into an adorable wall hanging or stitch him right onto a t-shirt or pillow case. 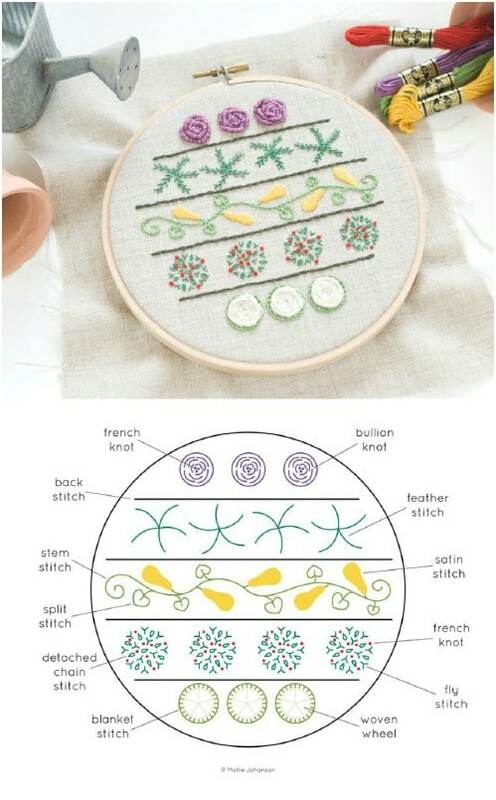 Here is another super easy embroidery pattern and one that allows you to try out different stitches. 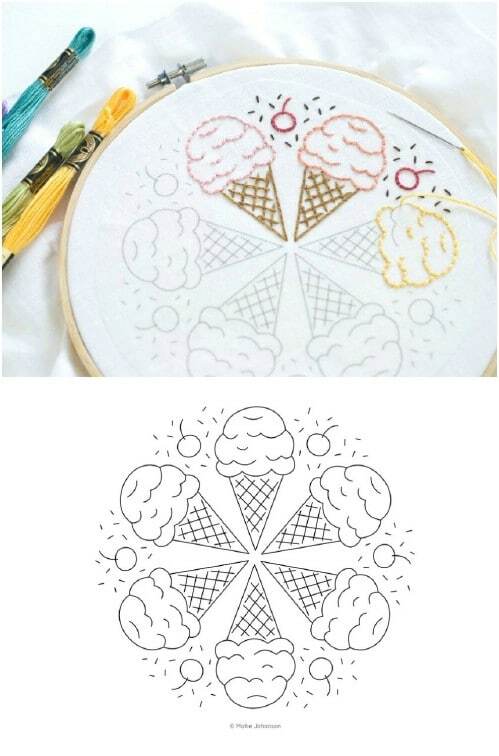 This ice cream cone mandala is adorable when it is finished and it is much easier to stitch than it looks. You can do this in any size that you want, just adjust the template when you download it. You use the back stitch on this one as well as the stem stitch, split stitch and seed stitch, but you can totally add in your own stitches to make it more unique. Chicken scratch or Amish embroidery is my favorite of all stitches and it is one of the easiest to do. It creates such a beautiful look, almost like lace when it’s done right. This heart sample uses chicken scratch, which you do on gingham fabric, and makes an absolutely gorgeous piece when it’s finished. Chicken scratch is simply making an “X” with your embroidery thread and it gives you the loveliest pieces. 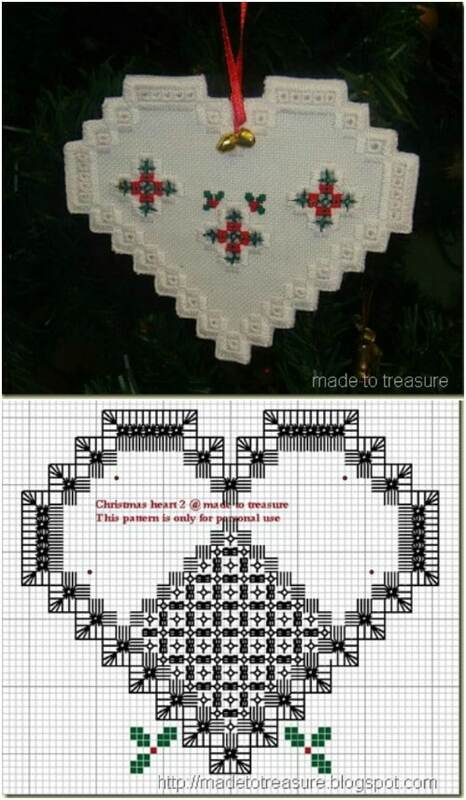 If you want to create your own Christmas ornaments, this embroidered heart is a great pattern to try. You could do this one in any number of different colors or stick with traditional red and green. This is a hardanger pattern which is much easier to embroider than it looks. It makes a stunning DIY ornament that you can hang on your tree or gift away as a gift. I love the cuteness of this donut pattern and this one is super easy to embroider. How adorable would this be on an apron? This one is actually on a zippered pouch, which you can make yourself, or you can just use the embroidery pattern to transfer this to just about anything you want. This would be so cute on a little girl’s dress, don’t you think? I was wondering how you got the free pattern for the Happy HO HO Holidays. I would like to have one to do! I just Love Christmas!! That is really good and informative post,Going to look for more details about it, thank you for sharing this post with us.